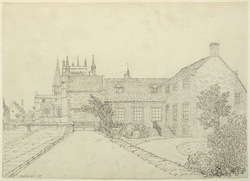 An east outline view in ink of the "Residentiary's House". A residentiary is an ecclesiatic, especially a cathedral canon, bound to an official residence. Southwell Minster was founded in 956, though little of the original Saxon structure remains. It was granted cathedral status in 1884.